The Monterey Bay Half Marathon takes runners through historic downtown Monterey, over to Cannery Row, along the shores of Monterey Bay, into downtown Pacific Grove, out to Asilomar and back along the coast to the grand finish at Custom House Plaza. Although the Half Marathon on Sunday, November 11th is the crowning event of the weekend, there are many other activities surrounding it. The Health and Fitness Expo at the Monterey Conference Center is free! Over 25 vendors will be on hand showing and selling the latest in fitness and health-related products and gear. Participants in the weekend&apos;s races can pick up their bib numbers and other event goodies. Free and open to the public on Friday, November 9th from 12pm to 6pm and Saturday, November 10th from 9am to 6pm. Not quite ready for a half-marathon? You can still run - or even walk - in the all new Pacific Grove Lighthouse 5K on Saturday, November 10th. This event, with a course just over three miles long, showcases the downtown and scenic coastline of Pacific Grove and is open to anyone in good health ages 5 and up. Register at the official web site. Children can also participate in the By-the-Bay 3K, also on Saturday. Participants in this fun run will get a T-shirt and a finisher&apos;s medallion. There will also be activities for children before and after the race. The main event of the weekend, the Monterey Bay Half Marathon takes runners through historic downtown Monterey, along the shores of Monterey Bay, into downtown Pacific Grove, out to Asilomar and back along the coast to the grand finish at Custom House Plaza. Spectators can watch from anywhere along the course. Register at the official web site. 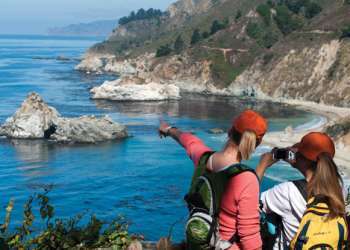 Several hotels in Monterey are all within a short walk or drive to the event.